Switching to solid foods: FAQ answered! Introducing solid foods into your baby’s diet can raise a lot of questions and concerns because it’s a big step! Hopefully this information will help to guide you through this exciting process! 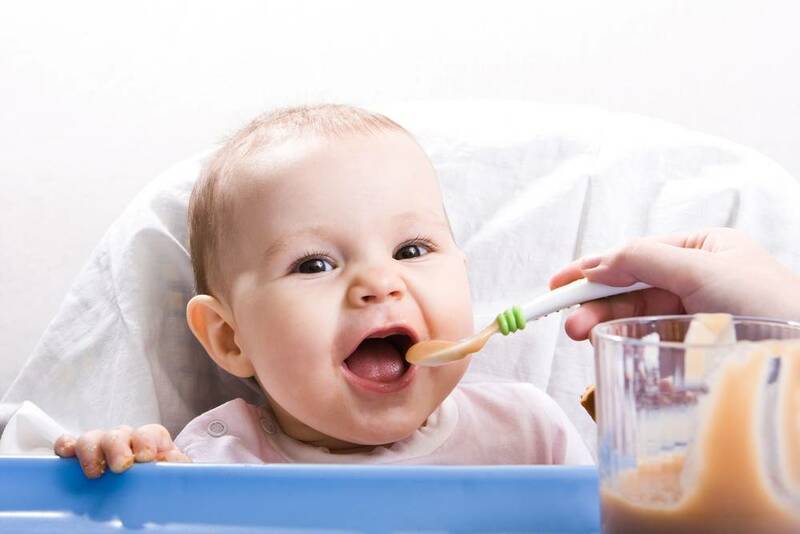 When can my baby begin eating solid foods? Head control – Can your baby hold his head up and sit up in a high chair or feeding seat with good head control? Eagerness – Does your baby seem eager to be fed? Does he open his mouth when food comes his way or does he reach for your food? Weight – Typically, when babies double their birth weight at around 4 months and weigh about 13 pounds or more, they may be ready! Do you remember the first time you held your baby in your arms? It was probably an experience you will never forget, right? Surely you remember your doctor, nurse, or mom telling you to be careful with his head. All newborns have little control of their heads because their neck muscles are weak and they haven’t developed the motor skills needed to support their head. After a few months your baby will acquire this key ability! One of the first and most important physical challenges your baby will face is learning to support his head and develop the neck muscles to do it. The acquisition of this skill is crucial since it will lay the foundation for other physical milestones like rolling over, sitting, crawling, and walking. Moreover, your baby needs to be able to support his head before you introduce solids to his diet. Could a baby’s social skills play a role in cracking the code of learning a second language? It’s clear that babies learn language best by interacting with people, rather than by listening to audio recordings or videos. However, it remained unclear which aspects of a social interaction were the most critical in order for babies to learn a new language –until now. A new study led by researchers from the Institute for Learning & Brain Sciences (I-LABS) at the University of Washington demonstrated for the first time a link between a baby’s ability to learn new language sounds (which will later translate in learning a new language) and a social behavior called ‘gaze shifting’. For those who are not familiar with the term, this early behavior happens when a baby makes eye-contact and then looks at the same object that the other person is looking at (example shown below).